Design a memorable piece of communication that raises awareness of the disease’s early warning signs, like memory loss, as well as reminding everyday New Zealanders of the importance of Alzheimers New Zealand. Concept: Actual working erasers were hollowed out and fitted with USB memory sticks. 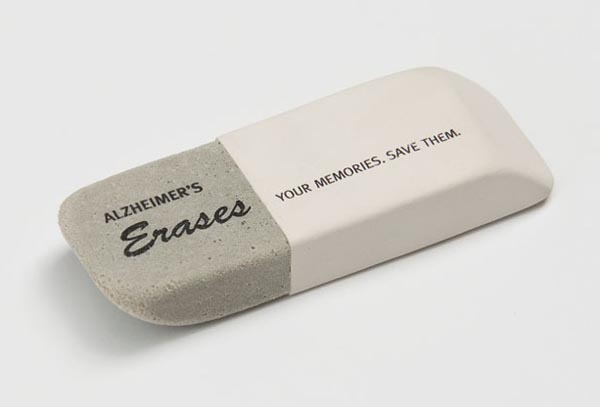 The message displayed on the top is: ‘Alzheimer’s erasers your memories. Save them’, with the reverse side featuring the Alzheimer’s New Zealand logo and website. Results: Alzheimer’s New Zealand distributed these eraser/usbs amongst the public, various local organizations, as well as distributed them to local politicians, with a letter, in an attempt to raise awareness of the charity. Feedback has been very positive and they’ll hopefully continue to leave people with some sort of understanding of what people with Alzheimer’s go through everyday, and where they could turn for more information and support. Recommendation: While I believe this was a very creative promotion, I would have liked to see a call to action with this promotion in order to help the organization achieve their ultimate goal of awareness as well as give them stronger, more measurable results. Either way, I rate this promotion with an A+ grade because of it’s creativity and unique approach. This promotion is a great example of how to take the ordinary and turn it into the extraordinary! Previous Polly Want A Bottle? Next Do you know what this is? I personally have 15-20 USB drives that I use for various purposes. Every time I pick one out of my desk, I have to read the imprint to remember who gave it to me. None of them have the immediate recall of the message and none of them were distributed in a way that made a lasting impression in my mind. Now, I know myself pretty well and if I had received the Eraser USB drive, I would have an instant recall of the message because it was unique and creative. As far as raising awareness to their charity, that really depends on who they gave the product to. Give it to a teenager and they will use it, but not really care much about the message.. Present it to a high level dignitary or the CEO of a company or a philanthropist and you could secure donations to help your charity with the research that is needed to defeat the disease. So that is how I view it.